In the summer of 2010, rehabilitation work on the OR 43, Oregon City / West Linn Arch Bridge began. 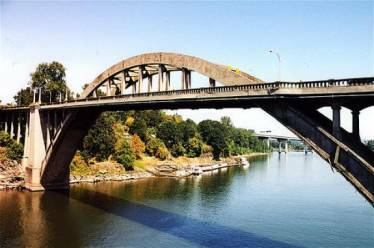 This historic bridge has spanned the Willamette River since 1922. After 88 years of use, the bridge was in great need of repair. For safety purposes, Oregon Department of Transportation closed the bridge down for approximately two years to be reopened towards the end of 2012. The extent of the repairs needed is due to corrosion of the underlying steel structure, damaged railings and the need to resurface the bridge deck. It has been estimated that more than 13,500 vehicles as well as 200 to 300 bicyclists and walkers cross the bridge each day. Needless to say, the rehabilitation and re-opening of this bridge is highly anticipated. As with most bridge repairs and rehabilitations, large amounts of fasteners inevitably need to be replaced. With any Department of Transportation project, the bolts and associated hardware need to be one hundred percent melted and manufactured in the USA. Portland Bolt is regularly involved in bridge projects due to our bolts being domestically manufactured here in house. The contractor hired to do the work contacted Portland Bolt with a requirement of approximately 3,500 lbs. of 1-1/2” diameter F1554 Grade 36 anchor bolts. Following the anchor bolts were numerous orders for various fasteners including 1-1/2” diameter high strength coupling nuts. As with most projects here in the Northwest, all of the fasteners were hot-dip galvanized, which we also do in-house. All of the required fasteners were delivered on time to insure that the contractors schedule was kept.